Are you looking for ICICI Bank Recruitment 2018 ? Here they have announced recruitment for Probationary Officers,Sales Officers,Phone Banking Officer. Want to apply for it? Now check below. 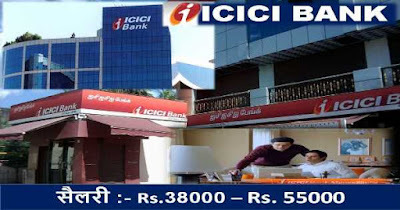 ICICI Bank, stands for Industrial Credit and Investment Corporation of India, is an Indian multinational banking and financial services company headquartered in Mumbai, Maharashtra, India, with its registered office in Vadodara. In 2017, it is the third largest bank in India in terms of assets and third in term of market capitalisation. It offers a wide range of banking products and financial services for corporate and retail customers through a variety of delivery channels and specialised subsidiaries in the areas of investment banking, life, non-life insurance, venture capital and asset management. The bank has a vast network of 4,850 branches and 14,404 ATMs in India, and has a presence in 19 countries including India. Jobs Details: ICICI Bank Invited Application through Advertisement for filling up the Post of Sales Officers for Job Location Mumbai,India. Interested and Eligible Candidates may Apply Online through website on or before Last Date. All Information about Position educational qualifications, age limit, selection and application process are given below. Graduation details are Candidates should have Bachelor Degree or equivalent qualification from a recognized university. No of Post: Not Specified. Age Limit: 18 to 28 Years. Job ResponsibilitiesThe incumbent would be responsible for achieving the monthly sales targets, assigned to him/her, for various products and services offered by ICICI Bank. Procedure to apply: Interested and Eligible Candidates may Apply Online ICICI’s Bank Website on or before last Date.